Trampoline House went to the People’s Meeting (Folkemødet) again this year in June to participate in the democratic debate on the asylum process and refugee rights in Denmark. Many people came to visit Trampoline House at the People's Meeting in June 2018. Photo: Morten Goll. This year, we have been a fantastic team at the People's Meeting. One of our events this year was an interview with a man named Goody, who just opened his own bike shop, and is the father of a son of six months. He told that he wants to expand his business and about how he struggled to make it happen. But now he knows the principles, and he is there to help people who cannot apply for other jobs because they cannot speak Danish. Another event in Trampoline House at People's Meeting was the house meeting every afternoon where interns, volunteers and the Director and other people from everywhere gathered together to talk about their opinions and come up with new solutions. We had those meetings in order to include people into the democratic practice of Trampoline House, and on the last house meeting on Saturday we had the best one. There were many people coming and they really loved it, especially the talking stick, which we use for every house meeting both inside and outside of the house. They called it ‘the magic stick’ and they said everyone put their power, energy and opinions into the stick and in their opinion, it is something incredible. And it's a good point that in our house meetings we let people have the stick and allow their opinions to be heard. That is a different approach than others, who just stand on the stage and don't give the chance to the audience to react. We had a guest from Dansk Folkeparti who attended one of the house meetings. She said she wants to learn about everything. She and her husband adopted a child from Chicago, and they taught him Danish. She said everything is not black and white for people in Dansk Folkeparti, as others think about us. There is discrimination on both sides. She wasn’t completely comfortable telling us that she was from Dansk Folkeparti. That’s why it’s an important thing for us to go to People’s Meeting and talk with people that are different from us. That is also why Trampoline House is going, to show that we are just people who want to live a peaceful life. That is also why we had an event with Nabila and Malak so that they could tell their story about being in the asylum system in Denmark. Nabila is 28 years old and from Morocco. She has been in Denmark for 12 years with her daughter, who was born here, and they are still in the asylum system. While they were telling their story, someone from the audience asked Malak about her future dreams. She said now she is only thinking of going to school like a normal person and having a safe future. Nabila’s dream is just to have a safe future for her daughter. I remember the man who asked the question started crying. Malak is not the only child who is in this situation. There are many children like Malak in the asylum system, and those are the stories we are at the People’s Meeting to tell people face to face. 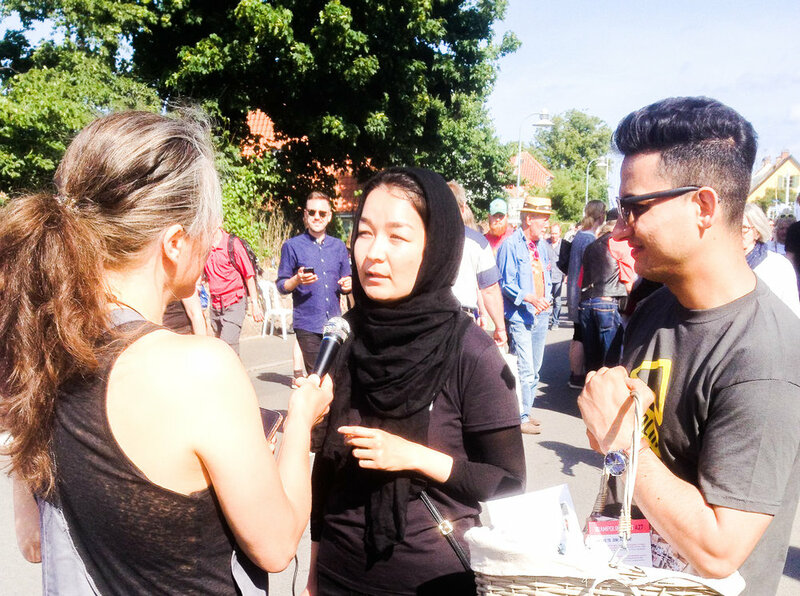 Masoumeh (middle) told many people about Trampoline House at the People's Meeting in June 2018. Photo: Julie Raun. Our job as members of this family of Trampoline House is to talk about what's going on in the asylum system. People can never feel exactly what we have been through, but at least we are fighting for our rights and it’s worth fighting when you see someone in the audience, who was in an asylum center herself, telling us to keep fighting, and that people on the outside of the asylum centers are fighting for us. We didn't reach an answer, but democracy is a process, and we must keep trying to have a democratic dialogue.